Since its inaugural launch in 2014, DOKU:TECH has grown in double digit percentages and expanded to include further topics and speakers in addition to the upcoming edition. The 2nd edition will kick off on August 8-9, 2015 and offers inspiration and a unique opportunity for participants to engage, listen, participate, and challenge speakers during talks throughout the programme. The programme is designed to inspire and explore minds. It will feature an incredibly diverse range of inspirational speakers and topics during the conference and will highlight the tremendous innovation occurring in the global stage. Esther Dyson is chairman of EDventure Holdings, digital visionary and innovation evangelist par excellence. Her primary activity is investing in and nurturing start-ups, with a recent focus on health care/genetics, human capital and aerospace. Investor and board member for a variety of startups (Square, Evernote, 23andMe, Meetup, XCOR Aerospace, Yandex, Flickr and many more.) Dyson has been called “the most influential woman in all the computer world”. Kentaro Toyama is a computer scientist and international development researcher, who works on the relationship of technology and global development. Toyama’s research in computer vision involves automated tracking of objects in video. A paper on probabilistic tracking he co-authored was a precursor to some of the technology in Microsoft’s Kinect product. Yanki Margalit is an Israeli entrepreneur and investor, best known for starting the security company Aladdin Knowledge Systems, which was sold in 2009. He is a partner in investment fund Innodo Ventures and a chairman of several technology startup companies, including SpaceIL. SpaceIL is a non-profit space technology organization that plans to land an unmanned spaceship on the moon by 2015 and is currently competing for the Google Lunar X Prize. Peter Sunde is a computer expert, artist and internet activist. He is best known for being a co-founder and ex-spokesperson of The Pirate Bay, a BitTorrent search engine. He’s also the co-founder Flattr, a micropayment and microdonation service. Sunde’s pretty active in the online community regarding freedom of information, copyright and online privacy. Elizabeth Stark is an entrepreneur and thought leader on the future of technology. She is a founder of StartBitcoin.org, a group of entrepreneurs building the future of digital currencies and decentralized technology and a fellow at Coin Center. Stark previously taught at Stanford and Yale about the Internet’s impact on society, the economy, and the law. Lane Becker is a familiar figure in the Silicon Valley tech scene for years, as the co-founder of Get Satisfaction and Adaptive Path, the latter one known for coining the technology terms “blog” and “ajax.” He is author of “Get Lucky: How to Put Planned Serendipity to Work for You and Your Business” book and previously an advisor to venture capital firm Freestyle Capital. Laurent Haug is an observer, strategist, investor, and creative matchmaker for industry leaders, start-ups, policy makers. He is Venture partner at Anthemis and a partner at MKS Alternative Investments. Founder of Lift, Switzerland’s first ideas conference on the subject of innovation, technology, and society and twice selected as one of the most influential person in Switzerland. DOKU:TECH proudly features leading women, with over 40 percent of the keynote lineup being female. In addition to Esther Dyson, DOKU:TECH keynote stage welcomes Arikia Millikan, ex-Wired now VICE, Elina Zheleva, Design thinking principal, among many other female speakers at the event. 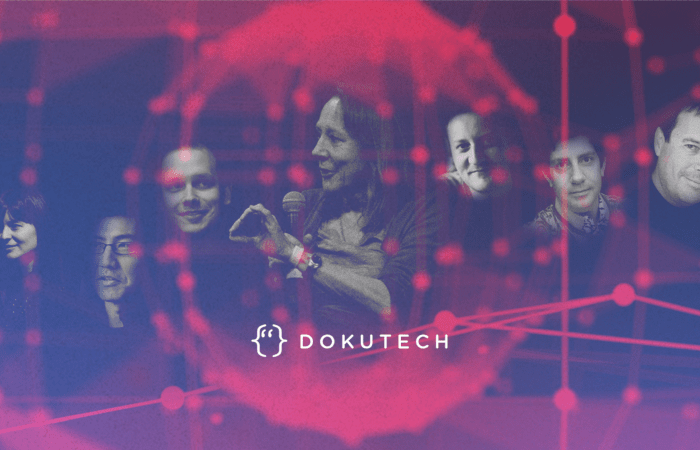 An event for creativity, engineering, and innovation, DOKU:TECH includes a multi-track conference, workshops, musical acts and a general networking event.